Mulching your garden beds improves soil health and prevents water loss through evaporation. Mulching is the number one rule for water conservation in your garden. Adding mulch to your garden beds can prevent water loss by up to 25 per cent, reducing evaporation rates and increasing the water storage capacity of your soil. Soil is the starting point for life in the garden (and in the forest, bush and grassland). It is continually being made in one of nature's great cycles. We can't make it - the plants and animals do - but we can assist the process by regularly returning organic materials to the earth. Mulching also suppresses weeds, which compete with your plants for nutrients and water, provides a stable soil temperature to promote plant growth and, of course, saves water. Follow our simple steps to improve the life-giving benefits of soil and reduce the quantity of water required in your garden. Size does matter. Coarse mulches are proven to be more effective at allowing water to pass through the mulch layer and into the soil. In terms of mulch, bigger does tend to be better. Anything above 5mm is preferred. Use your own garden waste first. Anything produced in your own backyard requires very little energy for transportation (probably just your own) compared to buying it, which has been transported from somewhere else and has embedded energy costs, which you'll pay for. If you're planning to use matter from home you'll need to consider a compost bin (to decompose the material) and/or a mulcher or old-fashioned chaff cutter. Find a local source of mulch. Talk to the experts and find out what local sources are available and suitable for your needs. Your local nurseries. Nurseries can help you select and purchase mulch. Check out the Yellow Pages for local suppliers. Your local arboriculturalist. Arboriculturalists and tree fellers may be happy to provide you with a door-to-door service at a relatively cheap price (sometimes it's free). Look under Horticulturalists, Tree felling and stump removal, Tree surgery, or 'Gardeners' in the Yellow Pages. 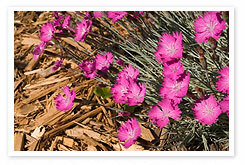 Select the right mulch for your garden. Mulches come in all shapes and sizes and what you choose depends on several factors, including the availability and cost of mulch and what plants you are working with. Ensure the area you are mulching is weed free. The best way to get rid of weeds is by hand. This is better for the environment and for you (a bit of hard yakka is good for us all). Any poisons you use will end up in the groundwater, which contaminates our freshwater. Dig in compost or worm castings. In addition to the mulch, composted soil or worm castings can be lightly dug into the soil. Wet the soil before you lay your mulch down. The best way to do this is to mulch on a day of rain, or the day after rain. Otherwise you have to give the soil a good soak yourself. Check to see the soil is getting wet and not simply running off. Poor soils (typically sandy soils) can become hydrophobic (they actually repel the water because of a waxy coating which has developed around the soil). If this is the case, add some compost to your soil and apply a frog-friendly wetting agent after the application of the mulch. Apply the mulch to a depth of 75mm. Avoid mulching right up to the trunk or stems of plants, as mulch can rot or burn the plants. Apply a (frog-friendly) wetting agent. This is particularly necessary if you have sandy soils or if you're in a drought area. Sit back and relax. Enjoy the beauty of your new garden bed, knowing you will save heaps of water and provide beneficial nutrients to your soil and plants for at least the next year. Want to do it all over again? Most mulches last for a year. An annual mulch in spring (or anytime before the hot weather arrives) may be all that is required. However, pea straw and lucerne tends to break down more rapidly and might need a more regular top-up. Some mulch alternatives. Gravels and pebbles can also be used as a mulch. While they can suppress weeds and save water, they generally don't feed the soil. These can be useful on some native and succulent gardens which have low nutrient requirements, but are not recommended elsewhere. Green manures. Green manures are plants (typically legumes) which are grown for the purposes of returning nutrients directly to the soil and are great for the veggie patch. After dying back naturally or being slashed while still green and soft, these plants are dug into the soil to return valuable nutrients ready for the next planting. Legumes (peas and beans) are most often used, as they are high in nitrogen and are able to release it in a form readily accessible to plants. Other plants, like Comfrey, have very deep roots and take up nitrogen and other nutrients from the subsoil, also making it accessible to plants. Easy Guide to Mulching (NSW Government). Canberra Organic Society has great information on how to grow green manures. Australia is the planet's driest inhabited continent. Any action that efficiently uses and conserves water while supporting the nutrient cycle to build soil biomass (a great way to store carbon) is a good thing. It's also an easy way to reduce the amount of weeding you need to do in spring, while adding to the health of your garden. Conserving water, especially during a drought and reducing our impact on the planet wherever we can is everyone’s responsibility. Many parts of Australia have experienced severe weather patterns and including prolonged droughts. With more dry, hot, windy weather is predicted in the years to come, we should all try to conserve water while maintaining our green spaces. By providing a good layer of mulch you prevent the evaporation of water from the soil and enhance its water retention capacity, ensuring there is more available to the plants and less need for additional watering by you. Mulching is physical work. It requires shovelling, carrying and spreading heavy loads around the garden. Doing this for just 30 minutes is equivalent to walking three kilometres or for 40 minutes; so jump to it and mulch your way to fitness.